Harlequin is hosting this trunk show featuring an impressive line of unique gemstone beads from Dakota Stones, the premier brand for semiprecious stone beads. Dakota Stones provides our industry with the most unique designer shapes and stones. 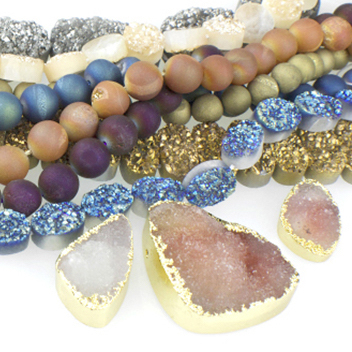 Dakota always surprises us with an amazing array of beautiful gemstones. This time we will have, new micro faceted small coins, star cuts, ethically source bamboo coral and wood beads and amazing Dzi bead style agates! Dakota Stones for designs that rock!